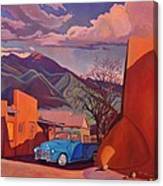 I think I recognize the back of the famous Taos adobe church. 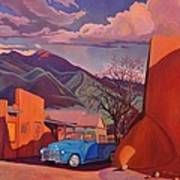 NARRATIVE A Teal Truck in Taos, SEPTEMBER in my 2013 Calendar! Vintage Trucks and Cars Missing a cowboy, a teal truck sat shiny blue amidst the orange mud brown adobe. 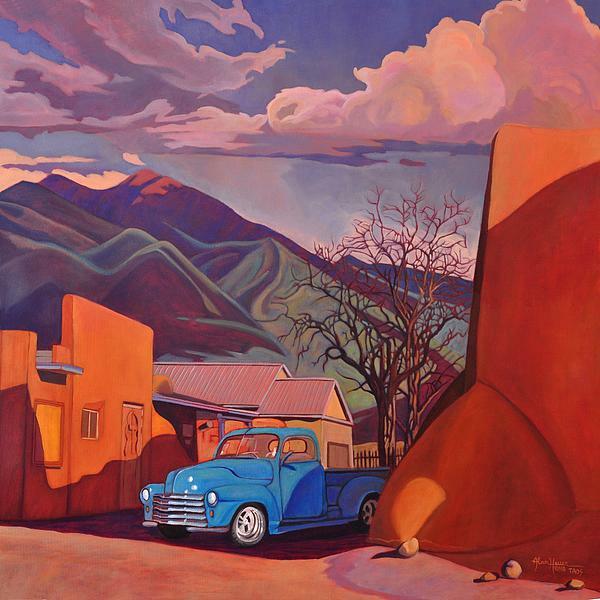 New like in a movie set in the old west waiting for a rider, chrome glinting white in the bright sunlight wheels waiting to turn another dusty mile down the old Santa Fe trail. Shadows danced on the big mountain and the old gnarled tree waited. 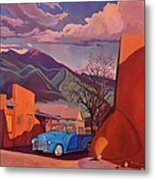 PRESS RELEASE NEWSLETTER For details on future discounts, ebay auctions etc, add yourself to my email list with Fine Art America via the Subscribe Tab. PRICING and ADDITIONAL ARTWORKS Please visit http://www.ArtWestStudio.com for pricing information and additional originals for sale.